There are dozens of furniture stores in Boulder — from furniture warehouses with brand new items to thrift stores that are fourth- and fifth-hand, our Flatiron town has a lot of choice when it comes to home furniture. While there might be many choices, there are none that combine the best of quality and affordability like No Place Like Home. 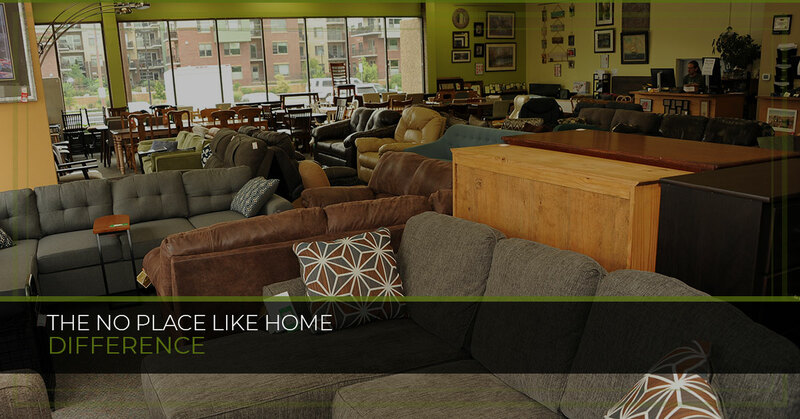 If you’re in the market for used furniture or want to consign furniture, look no further than our Boulder store. When you shop No Place Like Home, you can expect these unique differences. Remember that last time you tried to install a dresser by yourself, only to realize that you constructed the drawers upside down and had to take apart the whole thing? If time is money, that’s an epic waste. Plus, we all know the headache of trying to assemble furniture based on instructions that don’t even use words. At No Place Like Home, furniture assembly is a thing of the past. In fact, our team will assembly furniture for you. This makes sure your furniture is set up correctly the first time around, greatly lessening the chance that it can be damaged during assembly. Unlike other used furniture stores that might sell anything that lands on their doorstep, our store takes great lengths to inspect every single item for defects. Whether it’s a scratch on a wooden fixture or a rip in a couch, we don’t tolerate defects. In fact, we sell only defect-free used furniture. Just because furniture is used doesn’t mean it should be lackluster. At No Place Like Home, you have access to an incredible selection of high-quality, high-personality furniture. Getting a new piece of furniture should be the only thing that takes up space in your house. The styrofoam popcorn, plastic wrapping, and cardboard boxes shouldn’t be the main project. At No Place Like Home in Boulder, we handle all of the disposals for you. We remove boxes and all associated packaging, so you don’t have to deal with anything. As a Boulder used furniture store, we’d be remiss if we didn’t also responsibly recycle all aspects of the packaging. Most used furniture stores sell you furniture and call it a day. 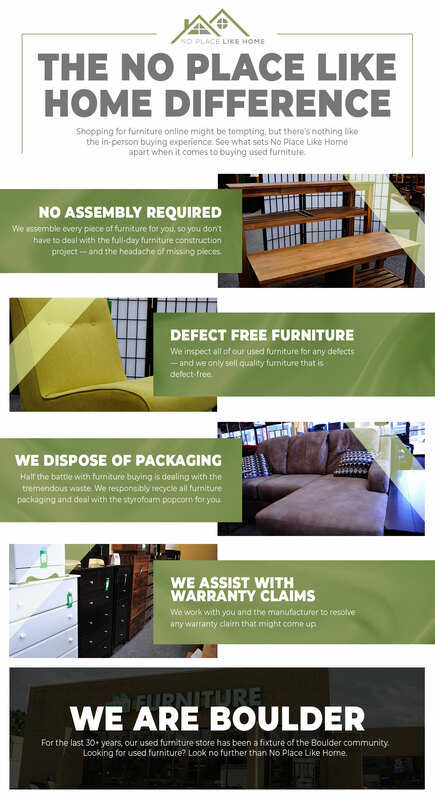 At No Place Like Home, however, we are committed to assisting with and honoring any warranty claim your furniture item might have. We even help you resolve your claim with the manufacturer, so you can be sure you’re getting your money’s worth out of your furniture piece. Our furniture selection is impressively unique. Most of our furniture is consigned from Boulder residents, so we feature an assortment of contemporary, antique, and luxury furniture — at an affordable price. Come in for a sofa and behold an incredible selection of end tables, lamps, and chic home furniture. Buying online might seem like the more convenient option — at first. But factor in the shipping time, the assembly required, the tremendous waste of packaging, and the need to negotiate warranty claims with robots, and you have a furniture headache. Save yourself time and give yourself a better furniture buying experience by stopping into No Place Like Home in Boulder. We also offer consignment services in Boulder, so we can pick up furniture from your home that you no longer need. Be sure to ask about our consignment services the next time you stop by! Contact us today with any questions, and we look forward to seeing you soon!